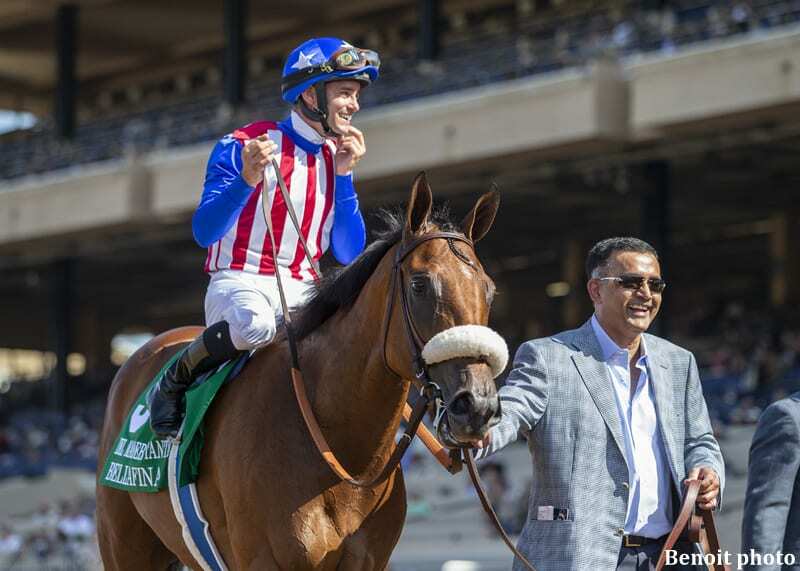 Both Kaleem Shah's Bellafina, a Grade I winner two starts back, and Bob Baffert's up and coming Mother Mother, cut back in distance and head a cast of five sophomore fillies in Sunday's Grade II, $200,000 Santa Ynez Stakes at seven furlongs. Throw in Doug O'Neill's Sold It, who pressed the early pace going two turns in Grade I company last time out, Keith Desormeaux's Grade I stakes placed Reflect and Steve Specht's recent Golden Gate Fields stakes winner Tomlin and the Santa Ynez has the look of a competitive affair which will provide the winner with 10 qualifying points to the Grade I Kentucky Oaks on May 3. A galloping 6 ½ length winner of the Grade I Chandelier Stakes at 1 1/16 miles here on Sept. 29, she was subsequently bet to the 9-5 favorite in the Grade I Breeders' Cup Juvenile Fillies at the same distance on Nov. 2, but tired to finish fourth, beaten 9 ¼ lengths after encountering trouble at the break. Despite the setback, this Quality Road filly, who fetched $800,000 at a 2-year-old in training sale this past March, has come back to train in sensational fashion for Callaghan at Santa Anita. In addition to a troubled start, Callaghan has also ascribed her sub-par Breeders' Cup performance to reproductive “heat,” a common concern with fillies and mares. Second, beaten 4 ¼ lengths by Bellafina three starts back in the Grade I Del Mar Debutante going seven furlongs on Sept. 1, this daughter of Pioneerof the Nile was then a gate to wire winner of a one turn mile stakes at Churchill Downs Oct. 28. In her most recent start, the Grade I Starlet going 1 1/16 miles at Los Alamitos Dec. 8, she made the lead and finished third, beaten a neck by highly regarded stablemate Chasing Yesterday. Along with a return to sprinting, Mother Mother will be reunited Sunday with Drayden Van Dyke, who rode her to a scintillating 6 ½ length first out maiden score four starts back on July 22. Fifth, beaten four lengths in the Grade I Starlet after pressing the early pace, this grey filly by The Factor broke her maiden going five furlongs on turf two starts back on Nov. 15 and should appreciate the return to a sprint distance. A respectable first-out third, beaten five lengths as the even money favorite in a 6 ½ furlong main track maiden special weight here Oct. 14, Sold It is out of the Malibu Moon mare Charade. Purchased for $200,000 as a Keeneland September Yearling, this Distorted Humor filly has won five of her three Golden Gate starts, including her most recent, a 2 ½ length score in the six furlong Golden Gate Debutante on Nov. 23. With all three of her wins coming at sprint distances on synthetic Tapeta, Tomlin's connections are confident she would relish an off track, should predicted rain fall on Sunday. This entry was posted in Racing and tagged bellafina, Bob Baffert, Mother Mother, santa park, Santa Ynez Stakes by Press Release. Bookmark the permalink.